Till 31 Mar 2018 Colgate Singapore: FREE Dental Checkups at Participating Dental Clinics in March! This Oral Health Month, make an appointment with your local dentist today and get a FREE checkup (examination and consultation only)! During the month of March 2018, free dental check-ups will be available at participating dental clinics. 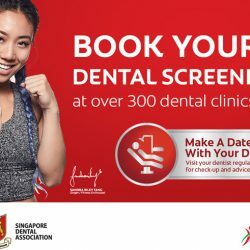 This community service aims to educate Singaporeans on the importance of regular dental check-ups as part of keeping good oral hygiene and is organized by the Singapore Dental Association and Colgate. Visiting your dentist regularly will help to maintain healthy teeth and gums. Members of the public wishing to benefit from this service should call any of the following participating clinics to make an appointment for their check-up.